"The great west window above the main entrance to the nave depicts the Adoration of the Lord as the Risen and Enthroned Christ in Heaven with a gathering of saints and angels. Around Christ we see the Virgin Mary, Saint Peter, Saint John, Saint John the baptist, Saint Paul, Isaiah, King David, Saint Jerome, Saint Basil, Saint Columba, Saint Hilda, Saint Helena, Saint Stephen, Saint George, Saint Agnes, and Saint Catherine. In the upper portion, there are angels with scrolls bearing the words of the Te Deum. Below them are angels singing and playing their hymns of praise. 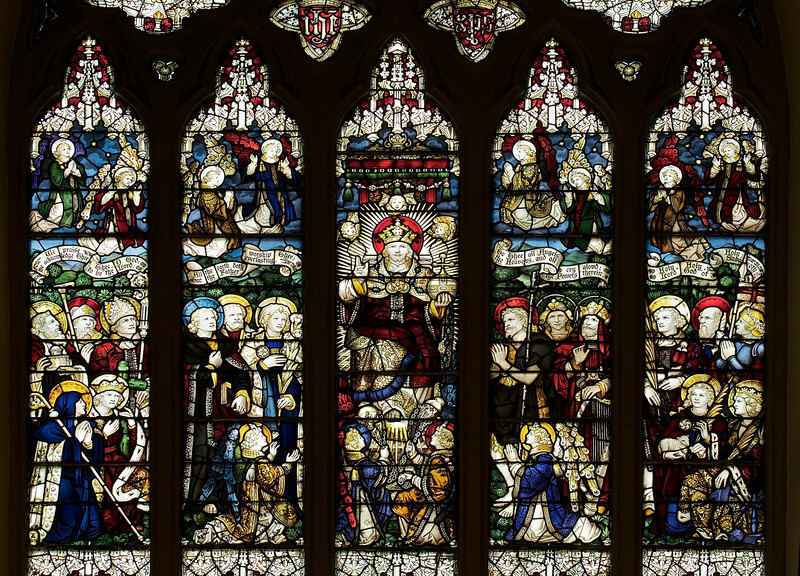 This window echoes the style of fifteenth-century English glass painters and was made by C.E. Kemp of England." Kemp also made the windows in the Chapel of the Nativity.